Pucks retired from their glory days gliding across NHL rinks get another shot as clever bottle openers. Retired from their glory days gliding across NHL rinks, reclaimed pucks get another shot as clever bottle openers. A win for any hockey nut, it's made from a puck played by their favorite team. The game date and teams names are written on athletic tape, and a unique hologram number verifies game details online. 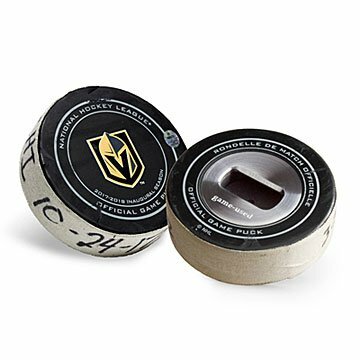 Each puck is officially licensed by the National Hockey League and comes gift-boxed with an authenticity instruction card. Designed by Erin Beales and Ward Wallau. Hand-assembled in the US. Please note each puck will have one-of-a-kind scuffs and scratches, and a team logo may be different from what is pictured. As these openers are authentic National Hockey League pucks, styles have limited availability. I would shop here again for sure. Thank you so much! His face lit up. This is awesome, authentic, and perfect for the hockey fan who also loves a good brew. I'm so excited and my boyfriend was so amazed that I found him such a cool gift! So much better than something that just sits on display! Go Preds! Awesome gift for the hockey fan in your life! The very unique nature of this game played puck is so fun and unique!! He loves it!! He's a true GK hockey fan!! The perfect gift for my brother in law who is somewhat difficult to buy for. I would never have come up with something like this on my own. It is unique and no one else is going to get him this gift. This arrived quick and is definitely special. Hockey Fans Are Going To LOVE This! He put this inspiring conversation piece in our basement bar (aka his man cave.) His friends love it! Awesome gift for any hockey lover out there. Comes with attached tag that states the date and game in which the puck was used. My man loved it! The team specific NHL used hockey puck is the perfect gift for a person who has everything. Understandably a bit pricey, but worth it!